It’s exciting times here at the worldwide headquarters of Mike’s Gone Fishin’. After weeks of constant spring rains, the skies are clearing and the Haw is settling into something that approaches fishability. This year’s generation of fawns will soon begin to appear alongside the gravel road leading to the house, raising the local cute quotient but lowering the potential for any of the new green to survive on the open forest floor. The new 5wt is getting an occasional workout. Pine pollen no longer coats every surface, including the interior of my sinuses, oak squiggles don’t clog the Ridgeline’s cool air intakes, and the old woodstove has probably held its last warming coals of the season. 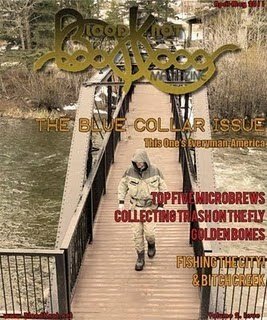 But the big news is that one of our favorite online fishing publications, BloodKnot Magazine, has temporarily and inexplicably abandoned its high editorial standards and included a short piece of mine in their current issue. We’re excited. Check out My Way, in the Crumbs section. Crumbs. How appropriate. It seems like a perfect time to say thanks to those of you who have been hanging around this blog. You have provided a wonderful sounding board for my sporadic ramblings, inanities, and experiments in fishing literature. Your presence and your feedback have always been deeply appreciated and I look forward to many more good times ahead, April Fools posts aside. For those of you visiting here for the first time, welcome. I encourage you to wander through recent entries and to visit the My Favorite Posts page for what I hope to be a decent representation of what you will encounter here should you decide to stick around. I hope that you do. And, for sure, a quick thanks goes to the folks at Bloodknot - Street Georgia in particular. He, and they, simply could not have been any easier to work with. Finally, to my fellow Triangle Fly Fishers members, while it may be true that many - most? - TU chapters carry a significant trout bias, it is definitely not the case with you guys. As a group you embrace, and chase, anything with fins and I love being a part of it. But while you may not actually have “salmonids on the brain”, as suggested in the piece, you have to admit that it makes for a good story. And you know that I will never let facts get in the way of a good story. P.S. Yes, the skinny old fart in the bib overalls is me. What can I say? They're comfortable. Congratulations Mike. Sorry I didn't recognize you as a skinny old fart or I would have mentioned you in my post yesterday. I would like an 8 x 10 glossy autographed please. Good stuff Mike. Most TFFer's get what fishing is all about. Fly fishing is fun in other places besides just cold water. No problem, Howard. I was thrilled to see your piece in the same edition. Cheers! Kev, it's a pleasure hangin' out with the TFF crew, for sure, warm water or cold. Mike I just read the actual article. Very entertaining and true. I missed this somehow. Congrats on being published.